Welcome to ENR's NEW top list and survey platform. 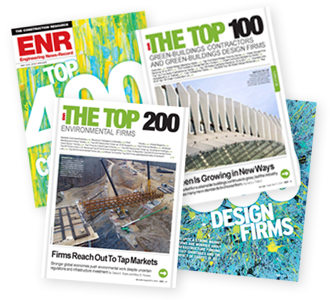 ENR attempts to bring structure to an otherwise huge and chaotic construction industry by performing annual surveys of its key segments, providing cost reports and ranking companies engaged in general contracting, specialty contracting, engineering, architecture and environmental services, among other specialties. Your participation helps ensure the most comprehensive data possible. Note: The ENR surveys have moved to a new platform. If this is your first time submitting an ENR survey through this platform, you will need to create a new account. This login information will be separate from both the previous survey system and the enr.com website. If you have previously completed an ENR survey in this system, please log in using the email address and password associated with your existing account. The email address and password can be shared within your organization. You can save, return to and edit your surveys before final submission. Please ensure that only one set of responses is submitted per firm for a survey. *There is no cost or obligation to create an account or complete an ENR survey. For password or technical assistance contact Hillary Swantek at swantekh@bnpmedia.com or call 248-244-6404. For information or questions about the survey contact Scott Judy at judys@enr.com.